An ambitious, beautiful JRPG that keeps on giving. What is it? An open-world action JRPG built around a great kingdom building sim. 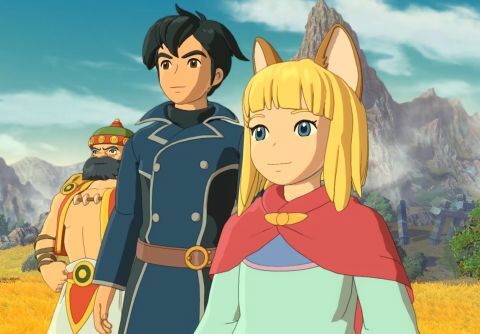 Ni No Kuni 2: Revenant Kingdom has done a fabulous job of hiding its best feature. It's an open-world action JRPG, but at its heart is a building sim where you've got a top-down view of a dollhouse-like kingdom. You raise buildings, generate resources, assign personnel and research tactics and sciences. Managing your kingdom is not just a thing to do between quests. It's the reason you quest. It's what connects Ni No Kuni 2's many ambitious systems and keeps them running, and more than anything, it's what keeps me coming back. Evan Pettiwhisker Tildrum, the half-catfolk prince of Ding Dong Dell (get used to the names because it's uphill from here), loses his crown to a coup staged by the ratfolk faction. During his escape, Evan meets Roland, a mysterious leader sent from another world. With Roland's help, Evan resolves to build a new kingdom, Evermore, and unite the four other kingdoms under a single banner to create a world without war. You visit each kingdom to convince them to sign Evan's Declaration of Interdependence and also to protect them from Doloran, a sorcerer who's undermining rulers by using magic and cunning to force them to oppress their citizens. Each kingdom is facing serious societal issues—brutal taxes, untenable work hours, absurd behavior laws. For a game filled with anthropomorphic animals, Ni No Kuni 2 tells a very human story. Each kingdom contributes a well-rounded short story, a thrilling and unique Kingmaker boss fight, and a valuable lesson for Evan. Which is to say nothing of the sheer joy of exploring them. Studio Ghibli wasn't directly involved with Ni No Kuni 2 like it was the original game, but it looks the part. The meandering streets of one kingdom are lined with thickly detailed casinos based on Chinese temples, food stalls packed with adorable dogfolk citizens, and rose lanterns which drench everything in crimson light. Another revels in the futuristic, all towering brass monoliths and rigid, starkly lit geometry. It's a beautiful world well worth saving, but I was always more interested in the characters. In particular, it is such a pleasure to see Evan mature as a ruler. He clings to Roland in the early stages of Evermore's development, constantly second-guessing himself and unsure how to proceed, but as he helps other rulers and is colored by them, he becomes more independent and finds his voice as a leader. And speaking of voices, much like everyone else Evan benefits from superb voice acting. There's an impressive range of accents on display, from Evan's reserved Britishness to rowdy Scottish shipwrights, and the mannerisms of characters like Lofty and Batu were more than enough to get me laughing. Thanks to Ni No Kuni 2's strong anime aesthetic, it runs well on a variety of hardware and still looks good even at the lowest settings. Despite not meeting the recommended CPU, Steven's rig (i5 3570k, GTX 970, 16GB) could handle the highest settings with only very occasional and mild framerate drops. Those looking to tailor every aspect of their performance will likely be disappointed by Ni No Kuni's limited graphics settings that only includes a few basic options. Ni No Kuni 2 feels best when played with a controller, but it handles well with a mouse and keyboard, too. Inputs can be fully customized no matter which device you use. Settings: Anti-aliasing, SSAO, Motion Blur, SSR, Bloom, Depth of Field, Sunshafts, Shadow Quality, Texture Quality, HDR Mode. All that being said, the best part of allying with a new kingdom is the flood of new citizens that comes afterwards—again, it always comes back to Evermore. Different citizens specialize in different fields, from farming to blacksmithing to magic and so on, so you're encouraged to meet and recruit as many as possible to expand Evermore's operations. In fact, you can only craft certain items and research (read: unlock) certain bonuses after you recruit specific citizens. The more of the world you've seen, the more you can do in it and the stronger Evermore becomes, and upgrading Evermore means upgrading everything. Likewise, Evermore makes exploration better. You get far more than passive gold and resource generation from your kingdom. Once you build the right facilities and recruit knowledgeable citizens, you can research game-changing buffs like increased movement speed, improved loot drops and experience gain, tools for navigating dungeons, and new abilities altogether. Some of the most enticing upgrades are those that improve Evermore fundamentally, making building and researching cheaper and faster, or unlocking new resource nodes and advanced utilities. It took me 50 hours to finish Ni No Kuni 2 with many side quests left over, and my eyes were silver dollars the entire time. I always wanted something. Hell, I wanted it all. The cycle of discovering, working toward, and finally unlocking things in Evermore delivers a gratifying sense of ownership. I can do this because I did that, and I want to do this so I can do that. I can upgrade my armor because I recruited better blacksmiths. I'm stocked up on consumables because I upgraded the general store. I want to build a dispellery and recruit someone to man it so I can purify and use my cursed weapons. I want to build better mining nodes so I can make a stronger sword. It never ends, and I never wanted it to. Combat improvements are especially rewarding because the real-time battle system is just plain fun. I always have a good time when I stumble on a wyvern-filled cave tucked away in Autmunia. You use light and heavy attacks to build combos, punctuate those combos with flashy AoEs and finishes, and dodge and block enemy attacks in-between. You build a party of three characters and swap between them whenever you want, and you will want to because everyone has a different moveset and unique skills. I never got bored of any one character, but I always appreciated a change of pace. Just like Evermore, combat runs much deeper than I expected. For example: the Zing system. As you deal damage with a weapon, it builds Zing, and once it's fully charged you can empty it to launch a souped-up skill. If you charge a fire sword and use its Zing to launch a fire skill, you'll deal more damage, which adds another layer to building loadouts and parties. Combat is further enlivened by the Tactic Tweaker, a collection of settings that lets you deal more damage to certain enemy types, take less damage from certain attacks, and even change granular stuff like your dodge's invincibility frames. To upgrade the Tactic Tweaker's options and potency, you just need to level up, and killing stuff to get better at killing stuff is nearly as engrossing as upgrading Evermore. Then there's Higgledies, adorable little sprites with names like Bumblebizz the Blowy who come with active and passive abilities that power up your party's skills. They yield noticeable boosts, so you always want to equip the four Higgledies that go best with your three characters. And where you do unlock and strengthen Higgledies? Evermore, the keystone in Ni No Kuni 2's staggering arch of systems which is elevated by everything else and simultaneously holds it all together. Ni No Kuni 2 is constantly moving on to new ideas, but it never gets messy because it's all anchored in Evermore. On top of normal third-person fights, there's a Dynasty Warriors-esque skirmish mode where Evan takes to the field surrounded by squads of chibi soldiers. It plays like a simple rock-paper-scissors RTS where you rotate units based on what the enemy is weak to, but rock-paper-scissors has never been so tense. I was fond of taking on Skirmishes way above my level and using Evermore's budget to purchase buffs to back me up, which led to some clutch victories. Then there's the nine Dreamer's Doors, secret multi-level dungeons which grow more difficult the longer you're in them. These were some of my favorite encounters. They reward you with better loot for surviving higher difficulties, and Evermore gains an eccentric new citizen if you complete all nine, which makes finding the next door a giddy "Aha!" moment. When it wasn't surprising me with yet more stuff to do, Ni No Kuni 2 impressed me by streamlining RPG basics with modern improvements. Instead of having to tediously pick up items, you automatically hoover up loot. Instead of the JRPG thing where you load into a pocket dimension after bumping into an enemy, if you see an enemy in a dungeon, you approach and fight normally, which improves the flow of dungeon-crawling, makes it easier to gauge enemy strength, and makes exploration tense. These are things I wish every game did.